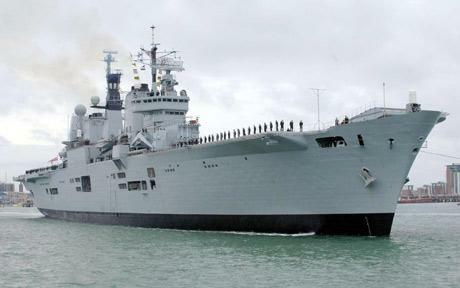 Well, not only is HMS Ark Royal to be scrapped but the Fleet Air Arm as well. In the meantime, the BBC has learned that "at least one" of the new carriers will be redesigned so that it can deploy normal fighter aircraft that do not need a Harrier-style vertical lift capability. Dr Fox says that there would be "interoperability" so strike fighter aircraft from allies such as France could land on UK aircraft carriers, and vice versa. So what have we here? No British aircraft, an Anglo-French agreement on joint carrier operation and now a carrier design change that allows for the operation of French aircraft on the British carrier. Where did you read this first? And as more and more details leak out, you can see the game – the Armed Forces are being stripped of capability to the point that they can no longer operate independently, even within the context of an alliance. We will have to look to "allies" for operational components just so that we can field our forces. Well, the US Armed Forces don't work that way, so we will have to look elsewhere. Where do we think Cammy and his euroweenie chums are looking? Why does the phrase "sold out" come to mind? But then, this has been on the cards for a long time, and we said this was going to happen in January 2006. That it should happen now, under a (partially) Tory government is not a surprise. Historically, the Tories have always been keenest on European military "co-operation" and the die was cast when Portillo signed the co-operation deal in 1996. Euro-Navy here we come, with the European Carrier Group as the flagship operation. We are now simply seeing the end came of a process that has been under development for decades, and which started with Heath and his merry men. Forget Thatcher (Blair and all the rest). Cameron is the true heir to Edward Heath. In the manner of Chamberlain and Munich, we now have "Heath in our time".